Cisco announced recently that with a new release it’s product Cisco Tetration Analytics now automates policy enforcement, enabling organizations to build secure environments for their business applications and also expands Tetration with new deployment options. 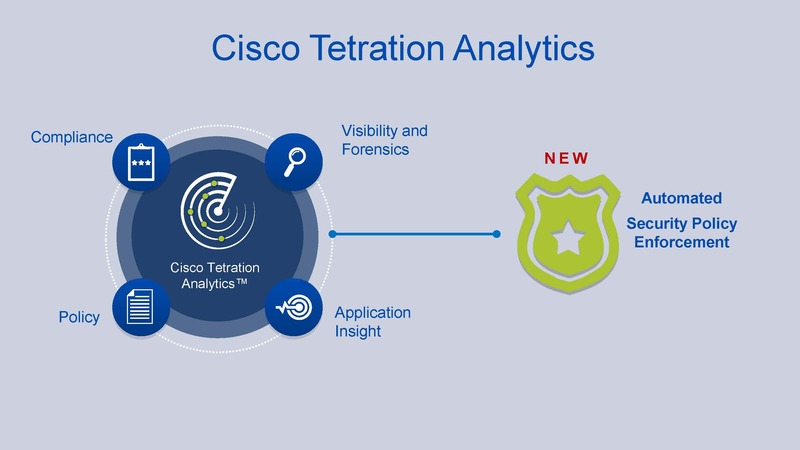 According to Cisco, the latest software for Tetration Analytics provides the industry’s first consistent security policy enforcement applied holistically across each application. Policy is enforced regardless of where the application resides: virtual, bare metal, physical servers, or in private or public clouds, across any vendor’s infrastructure. Interestingly, today’s complex business applications often span hundreds of servers residing on a wide array of heterogeneous infrastructure, both in the data center and in the cloud. Cisco reports that this complexity is further compounded by virtualization technologies, application mobility and constant application changes due to modern DevOps environments. As a result, IT managers are challenged to understand an application’s components, their communication pattern and dependencies – all necessary to meet security requirements for modern applications. Tetration Analytics deliveres “application segmentation”, which consistently drives policies across the application layer, regardless of where the application resides: virtualized, bare metal, physical servers, or in the cloud. Policies can be pushed to any vendor’s firewall, and can be orchestrated at the network layer as well. According to the announcement, Cisco is also delivering two new deployment models for Tetration Analytics. In addition to the original large scale platform, Cisco now offers a new smaller-scale platform, Tetration-M, suitable for deployments up to 1,000 workloads. Cisco is also introducing a new cloud appliance with software deployed in the public cloud on Amazon Web Services (AWS), Tetration Cloud – also suitable for deployments up to 1000 workloads. Regardless of the deployment model, Tetration can monitor workloads in private as well as public clouds.